You may need to read Part 0 of this series to make some sense of what follows. The context for all the comments is that people were discussing about how they have developed and matured over the years: what was helpful, what was more challenging. Although the focus was not on professional life, there’s still a lot here for leaders to mull over and learn from. On Saturday morning, we had interviews panels with Types 3, 6 and 9. First up, the 3. This Type is often called the Achiever and presents an archetypical picture of success to the world. The focus is on doing, there’s little time for being. To drop down a gear or two and begin to notice what’s going on inside, what important signals the body is giving. cj76530: #enneagram 3: notice the impulse to act and then contain the feeling. cj76530: #enneagram 3: it’s not always helpful to be helpful. D cj76530 Keep them coming – love this. @cj76530 interesting… it was this aspect that had me confused with 2 vs 3. why do you say this? I couldn’t trace back through twibble and twitter to pinpoint this, but my guess is, it refers to the helping tweet. The first is to recall, all tweets are coming from what people say about themselves, not what I say about them. I understood the point on helping to mean that the speaker found that they sometimes helping was a form of busyness to keep contact with one’s own emotions at bay; it also reflected that – in their world-view – love is earned through action. @cj76530 your three tweets about enneagram 3 were very helpful!! thank you! This was sufficient encouragement for me to continue the experiment. Onward! Type 6 is often called the Good Trooper or Devil’s Advocate. Although possessed of great courage, they often seem to focus on what could go wrong for or be threatening to their in-group. cj76530: From the #enneagram 6 panel: safety is a trap. cj76530: #enneagram 6: put HAVE TO aside and allow joy and fun to emerge. Another gem from the 6 panel that I thought might lose something without context was when one of the panelists explained how he applies St. John of the Cross’s dictum “Nada! Nada! Nada!” (“It’s not that! It’s not that! It’s not that!”) – the art of letting go of attachments, projections, anything that gets in the way of clarity. The 9 panel was a challenge for me to report on, because I was a participant in that one myself. It’s impossible to take notes when sitting center-stage and being present to the conversation. 9s are sometimes called the Peacemaker or Mediator. We tend to avoid conflict, since it will – in our worldview – threaten, if not destroy, the relationship. cj76530: From the #enneagram 9 panel: a bad day is when I can’t accept me as I am. A helpful strategy for 9s to improve, is to start small, just get the ball rolling. Since we go along with others’ suggestions easily, it’s important to be clear about why we do what we do. Often, we find ourselves doing things to which we have not committed. 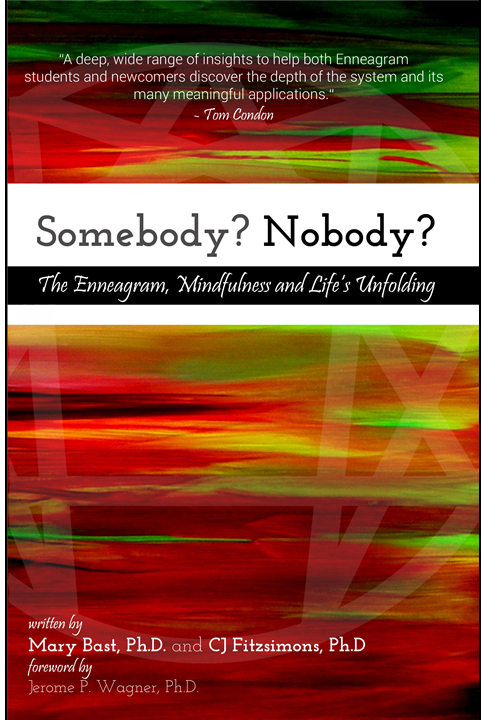 cj76530: #enneagram 9: for whom am I active? Me or you? cj76530: #enneagram 9 panel: watch out that ritual doesn’t turn into trance. @cj76530 Enjoying your Enneagram posts. Keep ’em coming. cj76530: More tweets from the #enneagram panels coming up! … in the next blog posting.